Eric R. Jackson, the one and only, in the flesh. 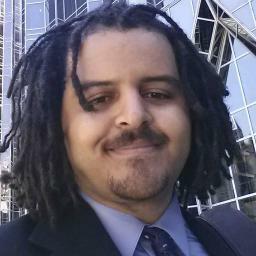 My name’s Eric R. Jackson, a 35-Year-old African American author seeking representation. While I’ve always been enchanted by writing and immersive stories, only recently have I created enough to call myself an author. I’ve maintained Memories of a Dimanagul as a form of mental weight lifting, Writing is a part of my daily routine. I serve as a moderator on the Harper Collin’s website Authonomy.com and I love meeting and chatting with writers of all skill levels. My initial interests in genre fiction came from a combination of my ‘Trekkie’ siblings and my attachment to pen and paper Roleplaying. I’ve always had a fascination with characters and have always loved creating them. While I love the sprawling worlds laid out the fantasy greats, I saw the most potential in the genre in the development and growth of people in fantastic worlds. All of my stories share a common theme, the characters stand front and center and their ideals and diversity is shown front and center. It is a disturbing trend that fantasy shackles itself to old ways because of the greatness of its predecessors. I challenge myself as an author to question the conventions of fantasy without defying them for the sole purpose of ‘defiance’. Dimanagul / TWO DESTROYERS is a project I began on 09/22/2011, one I created out of the inspiration to create a unique take on Epic Fantasy. Please take a moment to explore my writing here on Dimanagul.com and consider supporting my writing ventures in any way you deem worthy. I have hundreds of thousands (Probably more as I haven’t actually counted) words to peruse here. Like what you see? You can tip me here. I could -not- stop reading your blog Romance and it’s Impact on Storytelling. I was -totally- thinking of video games as I was reading about cheating death. Cheers to getting inspiration from video games. The first entry with Tillie and the two guys was pretty cool. I have two books that were inspired by video games. One is a trilogy that is finished, I just want to re-write it because I finished it in high school (it was around 1,200 pages, and took all four years). Now, the second book that was inspired by a video game is going to be at least 4 books. You might want to separate your entries a bit, I felt overwhelmed by how long the page was, and a little conflicted when I couldn’t -stop- reading it because it took so long. That’s a good thing, lol. But shorter pages would be a little better and allow for a break. That’s actually not intentional. For some reason ALL my posts end up on the first page. That’s a sign of me not knowing how to use WordPress correctly… heh. Thanks for the feedback though! Want to know a way to fix that? It involves making one page, many posts, and a lot of linking, but it can be done… In settings – reading, you choose “static page” and select a “front page” from the different pages you’ve already created. That means you can set one page as your “front” page. That’s usually an introductory page, with links to the different posts on it. I didn’t know too much about this until about four months ago, and I’ve been a member for like, two years. Check out one of my books linked in The Nexus to see what it looks like if you want (The Nexus is my main blog here at wordpress – just click on my name, Kyle Writtenword). Though, if you are going to actually read one, the Aorix Series is a good fantasy option. and, it was only supposed to be a small complaint, barely attached to the real reason for the comment – a compliment. Sorry if it didn’t sound that way. I like your “voice” / writing style. Oh not at all I’m glad you brought it up! It was driving me CRAZY.